"Where can I hide? That mean old cat wants to eat me for supper," Martin, the mouse, squeaked. "Maybe I should hide down here on the ground." He ran behind a bush and hid. "I smell blackberries." Martin looked around. "This is a blackberry bush. They smell sweet." He took a bite. "They taste sweet too." He picked another blackberry and gobbled it down. "That was delicious." He ate another, and then another. He ate so many blackberries that his tummy got round and plump and he could hardly move. Martin lay against a stone and putted his belly. "I think I ate too much. I hope the cat doesn’t try to chase me now." The cat crept through the grass. It didn’t make a sound. "Where did that mouse go? I’ll find him and eat him for supper." Paws looked behind a big stone, inside a hollow log, and even in an empty rabbit’s burrow. "Where’s that mouse? I’ll find him!" Paws sniffed the air. "I smell something sweet. It smells like blackberry juice." Suddenly he felt rather hungry. "If I can’t have a mouse for supper, I suppose I’ll have to eat blackberries." He spotted the blackberry bush and ran towards it. Martin had fallen asleep. He lay curled in a ball snoring. Paws picked a few blackberries off the bush. "What is that sound?" he wondered. "It sounds like snoring." He listened again. "It is snoring." He parted the bush and saw Martin sleeping. "It’s the mouse," he whispered. He reached through the prickly branches to grab it. Martin opened his eyes. "Yikes! The cat!" He ran out of the bush and up the tallest tree. Paws pulled his arm out and chased the mouse. "Come back here. I’ll get you!" he shouted. Martin went to the top of the tree and ran out to the end of a branch. "Gulp! I’m high up." He held on tightly, afraid that he might fall. He watched as Paws climbed the tree. "I’m trapped." Paws stood at the end of the branch. He knew he couldn’t walk out on it, as it wasn’t strong enough to hold him. Martin was much smaller than Paws. Paws had an idea. He grabbed hold of the branch and shook it. Martin flew up and down. He held on tight to the leaves and nearly fell. "Stop it. I’ll fall," he cried. "That’s what I want you to do. Then I can have you for supper," Paws said. He shook the branch again. "Just because you’re high up, doesn’t mean you’re safe. It’s a long way to the ground." Martin looked down. He was scared. If he fell, Paws would surely catch him. Paws shook the branch again and again, but Martin held on with all his might. After a while, the cat tired and climbed back down the tree. "Well, I guess I’ll have blackberries for supper after all." Martin stayed in the tree for hours, waiting for Paws to leave. 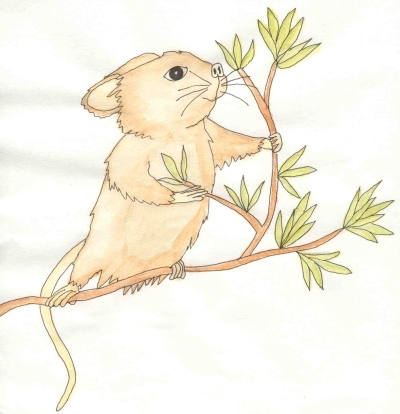 When he saw Paws run off into the woods, the mouse climbed down the tree. "Whew, that was close. From now on I’d better not eat so many blackberries and then fall asleep." Martin ran back to his mouse hole, where he was safe. "Tomorrow’s another day," he yawned and fell asleep, dreaming of plump, juicy blackberries.